Childhood Obesity is a condition where excess amount of body fat negatively affects the child's health and development. It is alarming to note that around 10 percentage of world's school aged children are carrying unnecessary excess fat in their body. Due to the rising prevalence of childhood obesity and its adverse health impact, it has been acknowledged as burning health issue. Childhood Obesity is a potential dangerous seed which can sprout into various ailments such as diabetes, Hypertension, sleep disorders, liver disease, early puberty, skin infections, respiratory problems, etc… Over weight children are more likely to grow up in to over weight adults. Obesity in adolescence is an indicator of reduced health status in adulthood. Recent studies have revealed that obese adolescent girl have higher risk of PCOD (poly cystic ovary disease) and infertility in adulthood. More over obese children suffer from social seclusion, discrimination, teasing, and resultant low self esteem, poor performance and depression. Thus obesity has a significant health consequence for the child and adolescent group both in short term and adult life. Obesogenic environment is the medical term which includes mosaic of all causative factors of obesity. · The greatest risk factor is the obesity of both the parents. Obese parents have 45% more chances of begetting obese offspring when compared to non obese parents. · Psychological factors also play pivotal role in obesity causation. · Easy availability and access to energy loaded food coupled with reduced energy requirement in daily life. · Childhood obesity is nourished and celebrated by the fast food industry which spends a lavish amount of $ 4.2 billion on advertisement for luring young children. · Physical inactivity and engagement in immobile activities such as watching television, computer and video games are the major culprits. Sedentary habits cause the unused energy in the body to be converted into fat. · Genetic factors and endocrine factors are also contributory. · In case of moderate obesity and associated physical signs the test for blood glucose, serum lipid, liver function test, ultrasound of liver, thyroid function test can be done. · A fasting lipid profile should be considered in obese children and adolescents especially in those with the family history of cardio vascular risk. · A fasting insulin and glucose test should be considered in obese children with the family history of type 2 diabetes. Obesity management is an essential lifestyle modification. Since it has to be pursued for a lifetime, continuous motivation and family involvement is inevitable. Before problem is addressed it has to be ascertained whether the parent and the child unanimously agree that there is a problem to be tackled. Realistic change cannot be expected without consent and motivation in a family setting. As far as childhood obesity is concern family factors, whether psychological, physiological or cultural are relevant. · A positive attitude is the first step towards fighting obesity. · Parents should have a realistic body image of their children. Blind comparisons are futile. For ex: it is normal to see the child’s rib unless and until the child is weak and less active. · Avoid giving food as a reward to children. For ex: Burger, pizza as gifts. · Food choices and selections must be taken up by adult in the family. · Breast feeding helps to counter childhood obesity. · Appropriate food and eating habits have a key role. · Breakfast, lunch and dinner time should be fixed as far as possible. · Munching snacks in between meals should be strictly discouraged. · The time duration between meals should be a minimum of 4 hours. · Avoid the dreadful combination of food and television. · Use less processed and tinned food. · Bakery and commercially marketed food items contain maida, transfats, artificial sweetners, colorings agents and preservatives, all of which are least nutritious and hazardous to health. · Encourage eating legumes, fruits, vegetables and cereals. · Contrary to the belief that planned diets are bland and boring, obesity diet can be prepared in a very tasty and interesting manner. Addition of ginger, garlic, onion can do the trick. · Reduce sedentary habits such as long hours of television and computer watching more than continues 4 hours. · Encourage physical activity such as brisk walking. · Children and adolescent group should engage regular physical exercise both at school and home. Clumsiness should be identified and curbed by parents and teachers as early as possible. The age old tested methodology of yoga is well suited for children. Yoga is a simple, economic, therapeutic modality that is beneficial adjuvant in obesity management. It works on all aspects (physical, mental, and emotional domains) of obesity. It makes the body agile and slim. It helps to control the mind in combating food habits. Yoga is safe and stable. 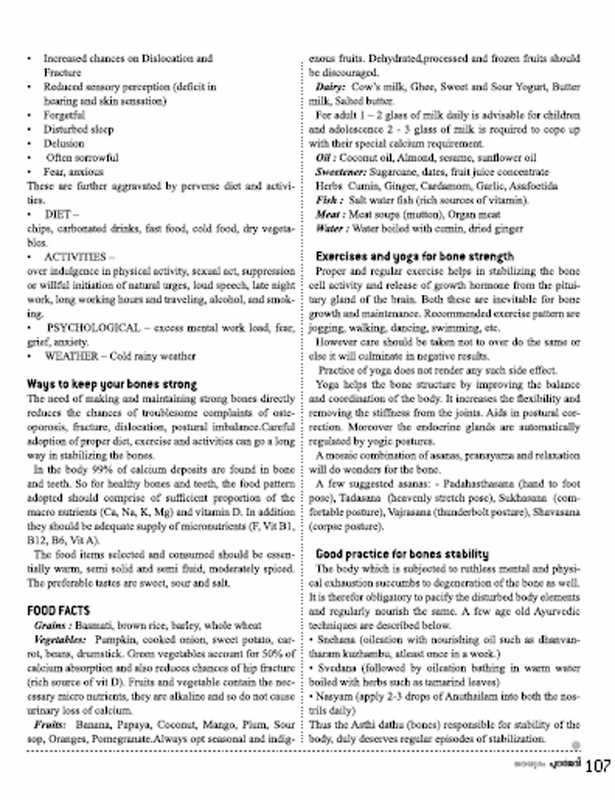 Some of the asanas that can be done are mentioned below. Childhood obesity is dangerous immediate attention seeking health problem. It has to be identified estimated and tackled carefully. Judicious combination of right food, optimum activity and positive attitude are the powerful weapons in this battle for health and happiness. Let us remember that growth of our children should be graceful, not gluttonous. Just as the trees are supported by the strong stems having compact mass in them, man is also supported by the strong Asthi (bone) present inside the muscles. (Acharya Susrutha)Asthi (bone) being composed of vayu and prithvi (air and earth element) emerges as the strongest, roughest and driest part of the body. It is thus destined to provide erect posture and strong framework for the body (dharana karmam) along with nourishing the bone marrow (Majja). Bone mass (bone mineral density) is the amount of minerals that a specific bone volume contains. Bonemass is considerd as the unit of bone strength. nevrlthless peak bone mass is acquired in adolescence. There is small increase in bone mass between the age group of 20 -30yrs. However bone mass starts declining after 30 years.the decline process gains momemtom at menopause for women, Around 1/3rd of women of the menopauseexperience fracture due to decreased bonestrength of the menopause. Inspite of personal variation the bonemass has certain level of generalized distribution.Usually the black race has stronger bonemasss than their white counterpart.Males have more bone strength than the females of the same age.According to Ayurveda, persons termed as Asthisara purusha( ie )those having well defined bones over the heels, ankles, knees, elbows, and wrist (etc) are endowed with health prosperity, success and strength. Decline in bone strength, pain and deformity of bones and joints indicate degeneration of body at a deeper level. Falling of hair of body and head, nail, teeth, rough skin and pricking pain of bones are direct indication of weak Asthi (bones). Giddiness, feeling of hollowness and emptiness of body, darkness entering into eyes and pain of the bones are pointers of depleted majja (bonemarrow). In addition to these the disturbed vata dosa accelerates the bone damage process. These are further aggravated by perverse diet and activities. • DIET – bitter, pungent, astringent food ? (chips, carbonated drinks, fast food, cold food, dry vegetables and fasting). • ACTIVITIES – over indulgence in physical activity, sexual act, suppression or willful initiation of natural urges, loud speech, late night work, long working hours and traveling, alcohol, and smoking. • PSYCHOLOGICAL – excess mental work load, fear, grief, anxiety. The need of making and maintaining strong bones directly reduces the chances of troublesome complaints of osteoporosis, fracture, dislocation, postural imbalance.Careful adoption of proper diet, exercise and activities can go a long way in stabilizing the bones. In the body 99% of calcium deposits are found in bone and teeth. So for healthy bones and teeth, the food pattern adopted should comprise of sufficient proportion of the macro nutrients (Ca, Na, K, Mg) and vitamin D. In addition they should be adequate supply of micronutrients (F, Vit B1, B12, B6, Vit A). The food items selected and consumed should be essentially warm, semi solid and semi fluid, moderately spiced. The preferable tastes are sweet, sour and salt. Vegetables: Pumpkin, Cooked onion, Sweet potato, Carrot, Beans, Drumstick,Green vegetables account for 50% of calcium absorption and alsoreduces hip fracture( rich source of vit d). Fruits and vegetable contain the necessary micro nutrients, they are alkaline and so do not cause urinary loss of calsium. Fruits: Banana, Papaya, Coconut, Mango, Plum, Sour sop, Oranges, Pomegranate.Always opt seasonal and indigenous fruits. Dehydrated,processed and foreign fruits should be discouraged. Dairy: Cow’s milk, Ghee, Sweet and Sour Yogurt, Butter milk, Salted butter. 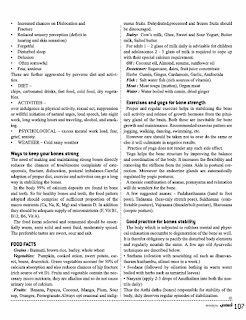 For adult 1 – 2 glass of milk daily, for children and adolescence 2- 3 glass of milk is required to cope up with their special calcium requirement. Fish : Salt water fish (rich sources of vitamin). How ever care should be taken not to over do the same or else it will culminate in negative results. Practice of yoga does not render the side effect. Yoga helps the bone structure by improving the balance and coordination of the body. It increases the flexibility and removing the stiffness from the joints. Aids in postural correction. Moreover the endocrine glands are automatically regulated by yogic postures. A mosaic combination of asanas, pranayama and relaxation will do wonders for the bone. A few suggested asanas: - Padahasthasana (hand to foot pose), Tadasana (heavenly stretch pose), Sukhasana (comfortable posture), Vajrasana (thunderbolt posture), Shavasana (corpse posture). The body which is subjected to ruthless mental and physical exhaustion succumbs to degeneration of the bone as well. It is therefor obligatory to pacify the disturbed body elements and regularly nourish the same. A few age old Ayurvedic techniques are described below. 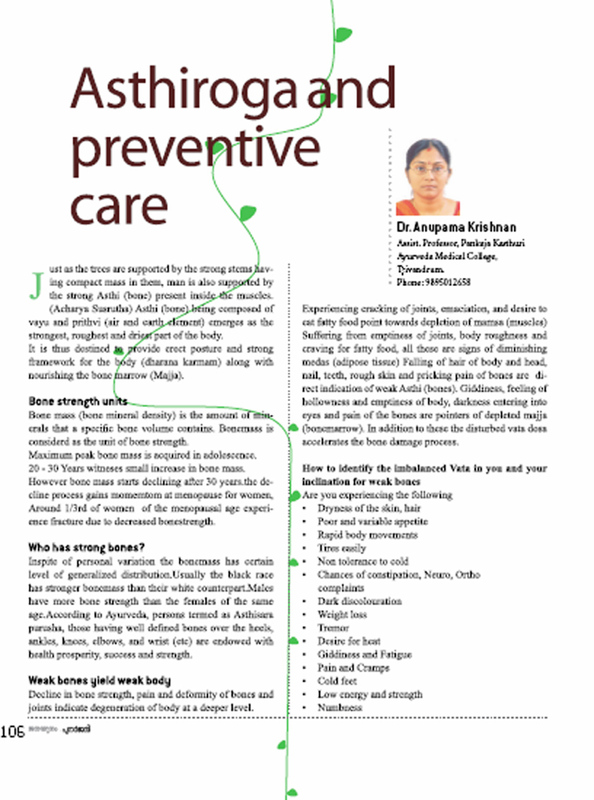 Thus the Asthi dathu (bones) responsible for stability of the body, duly deserves regular episodes of stabilization.